We propose that over the period of the Summer Solstice the public be allowed free and equitable access into Stonehenge and it’s surrounding landscape. This would enable people to freely attend as are their needs and customs: the Sunrise, Midday, the Sunset and the Solstice. Current overcrowding and driver safety problems are caused by the increasing popularity of the present open access and the decision to end access early on Solstice morning. We believe these problems can be resolved in the best interests of everyone by extending the access period to cover the whole of Midsummers Day. We invite English Heritage and other interested parties to support this Proposal in principle and look forward to working with them to further its aims. 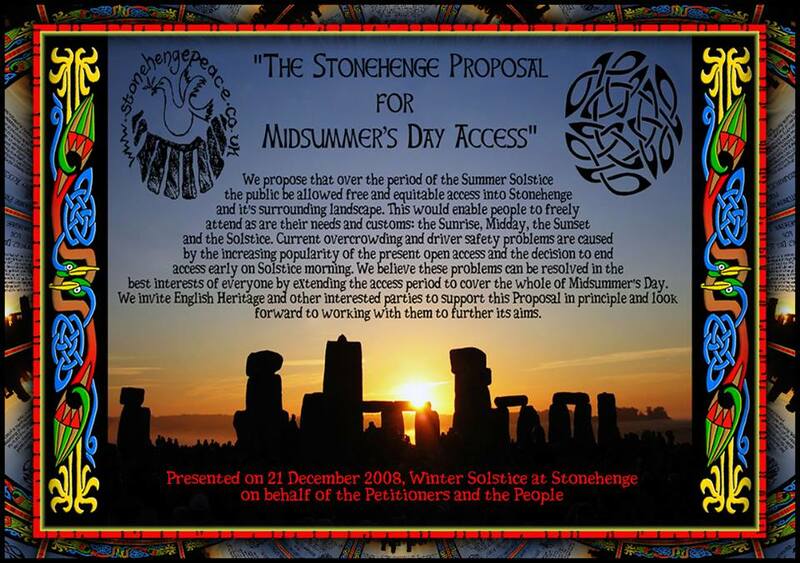 Presented on 21 December 2008, Winter Solstice at Stonehenge on behalf of the petitioners and the People. Previous PostBattle of the Beanfield (Stonehenge 1985)Next PostHello world!